News coverage of complications after plastic surgery often do not give the real story of what happened and why. Commonly, doctors who are not Board Certified by the American Board of Plastic Surgery, but who call themselves plastic surgeons or cosmetic surgeons, may be responsible for poor results. Dr. Karol Gutowski is a strong believer that patient safety must come first when considering a plastic surgery procedure. 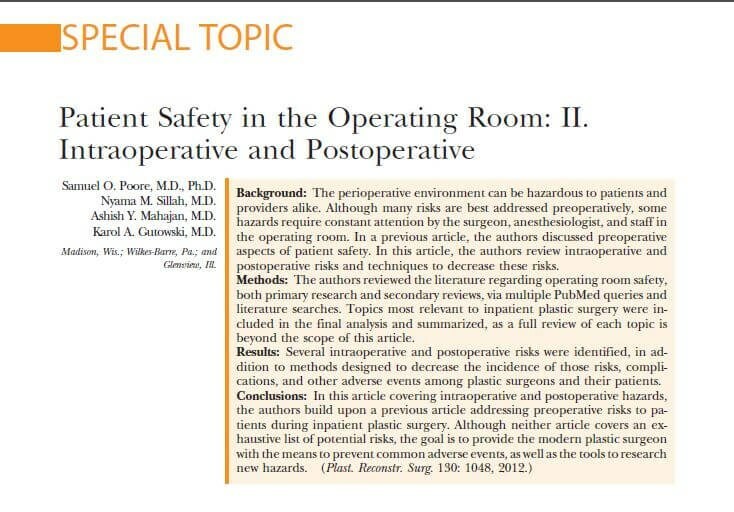 As such, Dr. Gutowski has authored and published many papers on patient safety, including the two below which were awarded Best Paper in Plastic Surgery in 2012. 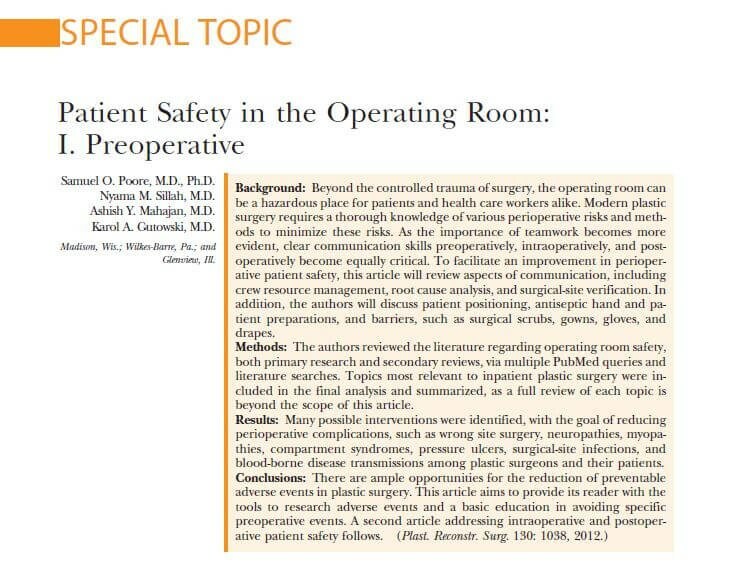 Question: How many procedures can be done at once and still be safe? The number of procedures done at the same time does not increase risk if each procedure is small and limited to the same body area. For example, an upper and lower eyelid procedure, fat injections to the face, and laser resurfacing may sound excessive but can be done in 2 to 3 hours – a length generally considered safe for a health patient. Another factor to consider is how fast a surgeon operates. Some surgeon take 30 to 40 minutes to do a breast augmentation, others take over 90 minutes. Since most aesthetic plastic surgery procedures involve the skin and superficial body structures, they place less stress on the body than more invasive procedures such as heart surgery. Question: How long can surgery last and still be safe? There is no “cut-off” time for safe plastic surgery but some studies suggest risk may increase after 4 to 6 hours, and more after 8 hours. However, a patients overall health, the type of procedure, and the type of anesthesia used, all play a roll in determining risk. A longer procedure using local or mild sedation anesthesia may be safer than a shorted procedure using general “gas” anesthesia. Question: How Can I Find a Board Certified Plastic Surgeon? Go to American Board of Plastic Surgery to find a Board certified plastic surgeon who is trained to operate on the face, breast, and body. Go to American Board of Facial Plastic & Reconstructive Surgery to find a Board certified facial plastic surgeon who is trained to operate on the face. Other official sounding boards, like the American Board of Cosmetic Surgery, are not recognized by the American Board of Medical Specialties and should not be considered to have the same level of training as the two boards mentioned above.